All water companies distribute drinking water through their pipeline distribution network. At strategic locations throughout the mains supply network, flow measurements have to be made to give a general overview of supply and demand and in some cases information about water losses through leakage along the pipelines. Often relatively large pipes of varying pipe materials constitute the backbone of drinking water supply networks. Most of these pipes have been in operation for some considerable time. In some cases flow meters had been installed at the time of the network construction, in others, flow metering had not been considered at all. 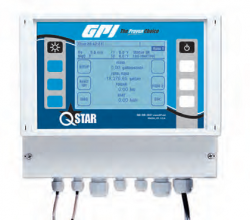 Contactless flow measurement for the Water Supply & Wastewater Services Industry. Katronic’s ultrasonic flowmeters can be installed on existing and new pipes alike without the need to open them. 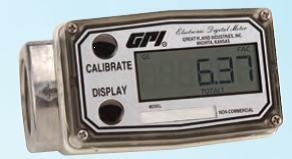 Display: two 4½ digit LCDs (12.4 mm or 7 mm high), as well as additional arrows. - serial interface: direct connection to RS232 or USB interface of a PC via electrically isolated interface adapter GRS 3100 or GRS 3105 resp. USB 3100 N (p.r.t. accessories). Min./Max. value memory: Memorizing of max. and min. values. 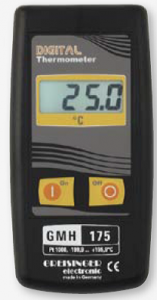 Hold function: By pressing a button the current values will be „frozen“. auto-Off-Function: 1 to 120 min (can also be deactivated). Offset and slope input: Offset- and scale correction can be entered digitally. GMH 3750 add. supports an user defined curve. the measuring value is constantly monitored if it remains within the min./max. limits (can also be deactivated). 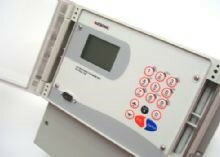 Logger start and stop via the keyboard or interface. Comfortable read-out and display software (GSOFT3050) available as additional equipment. Probe: Pt1000 probe, 2-wire, probe connection via 3.5 mm Ø jack connector. Probes not included – please order separately! dimensions: approx. 142 x 71 x 26 mm (H x W x D). impact resistant ABS plastic case, front side IP65, integrated pop-up clip for table top or suspended use. 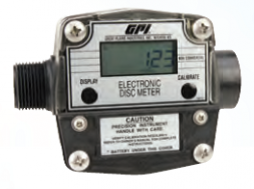 The electronic flow monitoring with calorimetric measuring method does not need any moving parts in the flow (i.e. no turbine wheel or float). Therefore this sensor can be also used with aggressive media. Continuously measurements of smallest quantities of – for example – flavorings, liquors, water, etc. 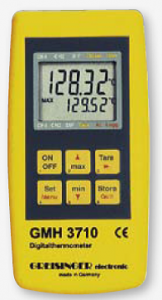 or chemically aggressive media is the main application field of the flow-meter HFK35-FIN. 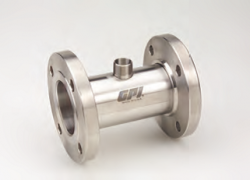 Process connection: TriClamp or G .
for a wide range of tube diameters. 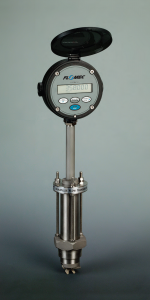 The level measurement is done by measuring the hydrostatic pressure. Pressure is created by the liquid column above the sensor and is directly proportional to the fill level. The results can be visualized or processed by means of evaluation electronics adapted to the sensor. The MLP series continuously measures the level of all flowable media with a 3-pole rod probe. Using electrostatic induction effects allowed us to move the reference pole into the probe. Therefore an electric connection is not necessary any more at the tank. This enlarges the field of application; i.e. 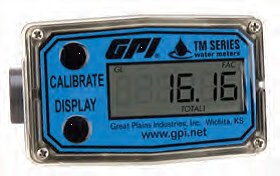 measurements in glass or plastic tanks.